People ask us what they they’ll be expected to do to maintain their new spa, so with the help of BioGuard, we put together this brief primer. We also look forward to discussing it with you in our store, where you’ll find we’re highly knowledgeable and friendly. 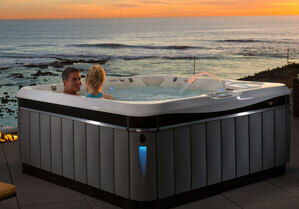 Your spa manufacturer and supplies manufacturers have done a great deal to simplify maintenance so you spend more time enjoying your spa and less time maintaining it. If you run your spa circulation system every day, your built-in filter will trap suspended particles and take them out of the water that’s in the spa. Coupled with the BioGuard SpaGuard® products North Shore Pool and Spa sells to all its spa customers, the filter will eliminate undesirable compounds and help prevent problems. A properly operating filter prevents most spa problems by capturing the hair, oils and cosmetics that wash off in the spa. We’ll be glad to advise you on how often you will need to clean the filter, which takes less than five minutes. You can reuse the filter several times: we’ll give you a schedule based on your use of the spa. We suggest a weekly SpaGuard Water Clarifier treatment to join together particles that are too small to be captured in the so they can be captured and removed. Regular cleaning of the spa surfaces is easy and fast. We recommend that you regularly clean the oily ring that forms at the waterline using SpaGuard Surface Cleaner. You can reduce your cleaning schedule and extend your filter’s useful life with SpaGuard Natural Spa Enzyme, which digests most oils and eliminates them from the water. Once you’ve drained the spa, you’ll clean the spa surfaces with SpaGuard Surface Cleaner, restore its shine with Spa Polish and then refill the spa with fresh water. We suggest that you test for two major elements in your water — bromine and chlorine — using very fast and simple BioGuard SpaGuard Four-way Test Strips. Based on your readings you can add SpaGuard products that will keep your water clear and safe all the time. At North Shore Pool & Spa, we recommend you bring us a water sample every four to six weeks for a more complete analysis, including alkalinity, calcium hardness, iron, copper, manganese and total dissolved solids. Based on the results, we’ll recommend SpaGuard products like Calcium Hardness Increaser, SpaGuard PH Increaser or PH Decreaser that will keep your spa looking and feeling great.